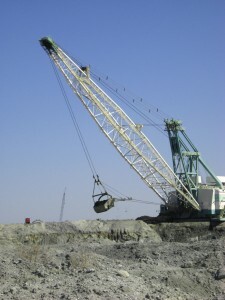 GMA – PCS Phosphate Company Inc.
For many years, GMA has provided geologic, hydrogeologic, mining, and environmental consulting services to the PotashCorp phosphate mine near Aurora, North Carolina. The facility is by far the largest mine in the state, and it is one of the main sources of phosphate in the world. In 2012, GMA provided professional oversight and training for mine dragline operators in recognizing regional geologic changes and trends in the excavated overburden and the phosphate ore body. We helped PotashCorp-Aurora complete their annual phosphate ore reserve depletion determinations used in the company’s SEC 10K report per NI 43-101 standards. In 2013 and 2014, GMA assisted the mining operations by conducting core drilling, sampling, and description of the phosphate ore for monitoring changes in ore quality and distribution. Drilling locations were chosen ahead of the mine advance to expand the geologic knowledge of the phosphate deposit and to provide ore quality characteristics that are critical to long range mine planning and the development of budgetary forecasts. Depressurization of the Castle Hayne Aquifer is required in order to maintain safe, dry mining conditions at PotashCorp-Aurora. GMA developed a 3-dimensional groundwater computer model to evaluate the drawdown effects of depressurization of the Castle Hayne Aquifer over various stages of the planned mine advance. GMA has also provided environmental assessment, monitoring, and remediation services at the PotashCorp-Aurora facility.